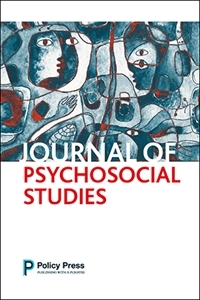 The Journal of Psychosocial Studies publishes work that falls within the broad transdisciplinary area of Psychosocial Studies, defined by a commitment to understanding the significance of the links between internal and external worlds. Psychosocial Studies draws on a range of disciplines to explore the interactive relationships between self, culture and society. Whilst often focusing on affect and emotion it explores the complexities of subjectivity and experience as it is lived and shaped in different contexts and settings. This approach is defined by a commitment to exploration of the links between the internal and external worlds; both the deeply personal and profoundly social. We are interested in publishing papers that bring a psychosocial perspective that might help us understand a range of contemporary social phenomena. This might be work on family life, welfare practices, criminal justice issues, youth work, cultural products (such as film, art and literature). As the adopted journal of the Association for Psychosocial Studies (APS) we especially seek to promote work that is interdisciplinary and considers issues of practice. The Journal of Psychosocial Studies provides space for research and writing that crosses the traditional boundaries between disciplines in the social sciences, humanities and the arts. We also publish work that emerges from and reflects on practice (that might include for example: social work, education, law, business studies, psychotherapy, group analysis and counselling) that draws on these theoretical frames. The Journal provides both a supportive and an academically rigorous space for new and established researchers to disseminate ideas, and hence stimulate debate in the psychosocial field. We welcome submissions from across the globe. Our strong International Editorial Board ensures that the Journal of Psychosocial Studies provides a publishing platform that transcends international boundaries. All published academic articles undergo our thorough double-blind peer review process. Please see the instructions for authors to find out how to submit an article.